I have seen these kind of shells on the beach so many times but I have never seen the creature that inhabits the shell before. 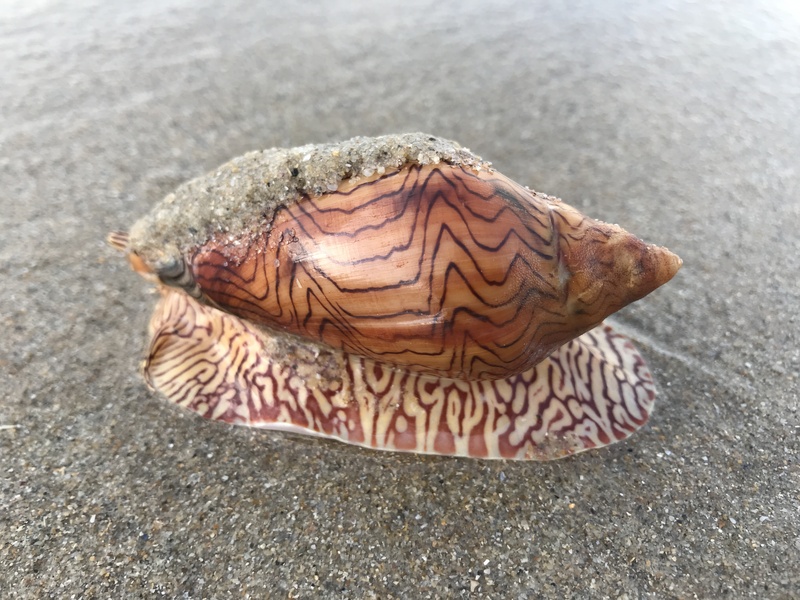 I was fascinated that the markings on the creature matched the markings on the shell. I had assumed that the creature would be plain but in reality maybe I had never really thought about it. As usual when I’m walking on the beach and see things like this it gets me thinking in metaphors. Today’s reflection is about who we are on the inside and who we are on the outside and if these match? Often we show the world one version of ourselves (our shell) but in reality we are experiencing something very different on the inside. When I talk about the shell I don’t just mean the clothes we wear (although that is one way to show the world who we are) but how we are in the world. Do our actions and interactions reflect who we are at the core? My answer would be ‘sometimes’! The word YOGA is translated as ‘union’ or ‘connection’ and I use YOGA as a tool in my life to get my insides and my outsides to be a closer match. This is also why I like to share YOGA with others. This is also why it doesn’t matter what YOGA ‘looks like’ it just matters what it ‘feels like’! Why not come along to a class sometime and feel, flow and connect. Maybe we’ll get our shells and our insides to be a little closer to matching.